China Martens is a writer, glamazon, and empty-nest low-income anti-racist white radical single mother. She is the author of The Future Generation: The Zine-Book for Subculture Parents, Kids, Friends and Others (Atomic Book Company, 2007), and coeditor of Don’t Leave Your Friends Behind: Concrete Ways to Support Families in Social Justice Movements and Communities (PM Press, 2012). Since 2003, China has cofacilitated numerous workshops to create support for parents and children in activist and radical communities at universities, conferences, and healing spaces across the United States and Canada including the Civil Liberties and Public Policy Conference, Allied Media Conference, and book fairs from Montreal to New Orleans; Minneapolis to Santa Fe; and New York City to San Francisco. She also was a cofounder of Kidz City, a radical childcare collective in Baltimore (2009–2013) and is connected to a national circle of radical childcare collectives established at the 2010 US Social Forum in Detroit. Contributors include June Jordan, Malkia A. Cyril, Esteli Juarez, Cynthia Dewi Oka, Fabiola Sandoval, Sumayyah Talibah, Victoria Law, Tara Villalba, Lola Mondragón, Christy NaMee Eriksen, Norma Angelica Marrun, Vivian Chin, Rachel Broadwater, Autumn Brown, Layne Russell, Noemi Martinez, Katie Kaput, alba onofrio, Gabriela Sandoval, Cheryl Boyce Taylor, Ariel Gore, Claire Barrera, Lisa Factora-Borchers, Fabielle Georges, H. Bindy K. Kang, Terri Nilliasca, Irene Lara, Panquetzani, Mamas of Color Rising, tk karakashian tunchez, Arielle Julia Brown, Lindsey Campbell, Micaela Cadena, and Karen Su. 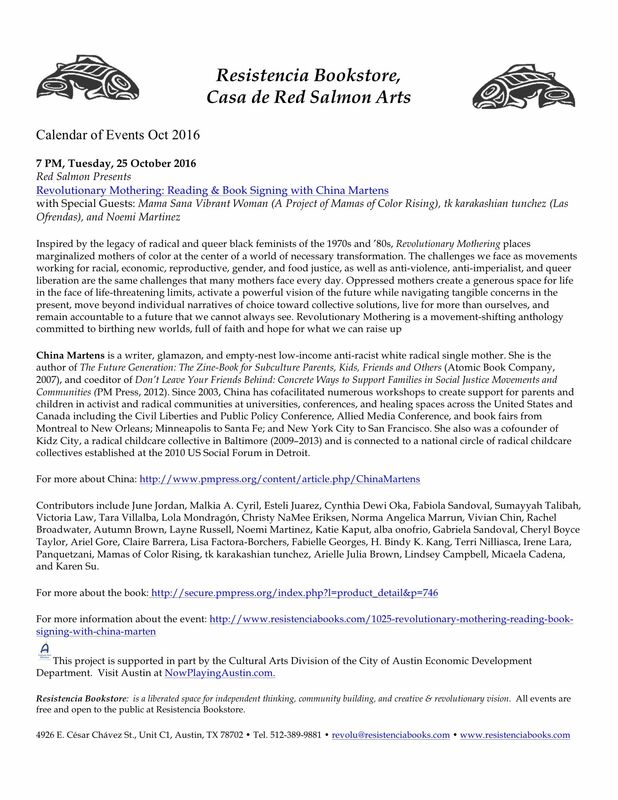 These projects are supported in part by the Cultural Arts Division of the City of Austin Economic Development Department. Visit Austin at NowPlayingAustin.com.